Here is the Sharing of My World, week 23! Wow, week 23 already. We’re almost half-way through the year, and I’m now on 2 weeks annual leave. I have quite a few jobs to do, but I know from past experience that the more time I have, the less I do, so we’ll have to see how it all works out. I’m pretty sure I’ll be using my PS4 a lot, if nothing else. 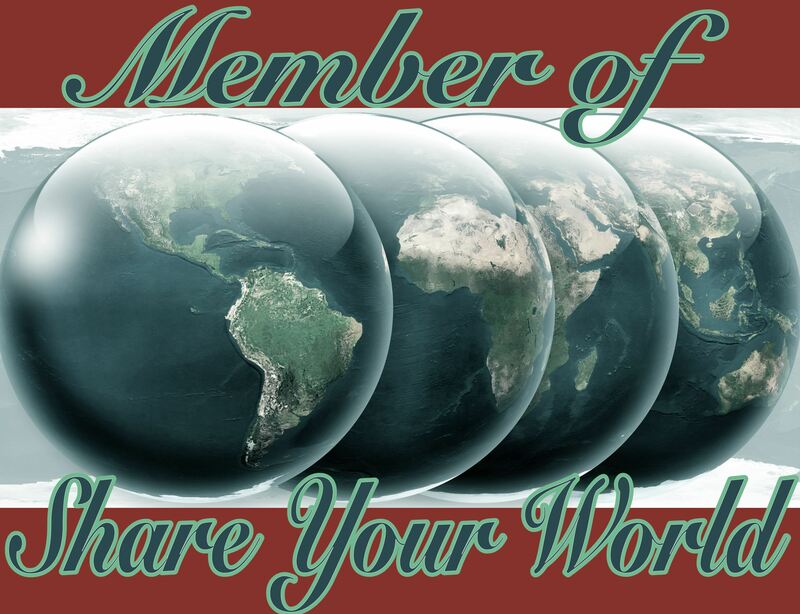 Share Your World is hosted by Cee over at her photography blog. Head over there for great photos, photography tips and more. I’ve Googled “Daytona 500” and it appears to be 500 miles of driving round in circles. That’s not for me! The plane trip sounds lovely, even with “mild turbulence”. I could look out the window, maybe have a nap. I can’t imagine not being alone at all for a whole month. That sounds like some fresh circle of Hell. Being alone for a whole month sounds idyllic. Maybe the plane ride drops me off somewhere nice and it’ll be back in a month to pick me up. Tricky. Being up a tree would afford a good view, but it seems too exposed. I’ll go for snuggled underground. It would have to be bug-free, however. I’ll need some surveillance cameras to see what’s going on above-ground, too. The only problem would be lack of natural light. Once of those houses buried in a hill-side would be nice. Generally I would prefer to be a driver. I’m so seldom a passenger I’m not really used to it, and I very seldom have passengers in my car. The only time I’d rather be a passenger would be when driving in a unfamiliar city. In that circumstance I’d rather be navigator(*) – I’m quite good at looking ahead on the map(**). Of course your area would be bug free. That’s the only way to go. 🙂 Thanks for sharing. A bug-free burrow is a happy burrow! You are NOT the only one who still uses paper maps! I am this couple Sat-Nav because I can read a map … even in a moving car!! I don’t get on at all well with bugs. I don’t trust satnavs either, plus surely they’re a distraction while driving? If I get lost I prefer to stop and get my bearings. I can understand the comfort of underground but they build nests as living spaces, check out tree house’s. To sleep in the sway of a tree top listening to the wind through the branches, ahhh. I quite like the idea of being safely enclosed I suppose. I don’t know how safe I’d feel up there in a tree (though the swishing and swaying would feel relaxing, it’s true). I am completely opposite to you. Underground. ick, I don’t imagine you could be bug free anywhere underground. The driving either way is fine though I’m not a good passenger. I’ll find a way to be bug-free! I bet trees have their fair share of bugs as well though. Of course they do. I live a basement so I am pretty much underground. Ants come in when it’s gets cold. Other creepy crawlers do too. As my friend says this is their home. And it’s dark when the sun is shining. But you’re funny you want to be underground instead of a tree and in a plane instead of a fast car. Well I guess it’s the same for me I rather be in a tree and in a fast car. In all the pictures of Indian cities I’ve seen it does look very busy and crowded. I wouldn’t like that at all! Cool linguistic note you brought up – footpaths in India, sidewalks in the USA and pavements here in the UK. We have “footpaths” but they’re not next to roads, they’re through parks and woods and whatnot. In the pictures I saw of Daytona, it looks like there’s a big possibility of accidents. The cars all seem to be driving so close together. Definitely better off in the air. This cracked me up – surveillance cameras above ground too! haha! Also your notes for kids were hilarious! I agree with everything you said except I think I’d need that human sized nest up in a tree…too claustrophobic to go down below! I think I’m the only person who’s opted for the hole in the ground 🙂 But I would definitely need those surveillance cameras. I hate not being able to see what’s going on.